Frances brings many years of office administration and customer service experience to the team. She provides administrative support to the growing number of clients in our Coeur d’Alene office. She delights in getting to know others and has a passion for helping people improve their financial health. 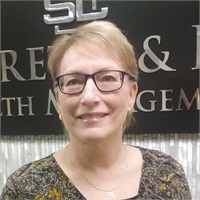 She is not new to the financial services industry and considers it a blessing to have joined the Schrette & Lee team in 2019. She worked for a dozen years as contract staff in many industries and a variety of customer service opportunities including aviation, banking, retail and healthcare, but she says the financial services industry is her favorite. Frances was born and raised in Long Beach, California. She met her husband at the local airport where they both worked. On days off from their jobs they went to the mountains to enjoy the trees and smells that weren’t found near their home. Frances moved with her husband Mike, daughter Michelle and son Ryan to North Idaho in 2011 after Mike retired from the Santee Fire Department near San Diego. Frances loves the distinct seasonal beauty in North Idaho and Christmas trees year round. Her daughter enjoys drawing and animals and is blooming as an adult. Her son goes to North Idaho Christian School and enjoys time with the family, dogs and cat. Frances believes in God and would rather be biking and hiking than in the kitchen. She looks forward to the adventures in her day and in her future.